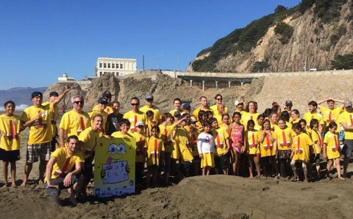 Support Arts Education with Leap Sandcastle | Forell/Elsesser Engineers, Inc.
Forell/Elsesser is fundraising and donating our time and skills for the 34th Annual Sandcastle Classic! The event will be taking place on October 15 from 11AM-4PM at Ocean Beach. F/E is part of the Sandy Warhols team with XL Construction, Harley Ellis Devereaux (HED), Bradley Concrete, Walter P. Moore, and the Diane Feinstein Elementary School. To view photos of our team competing last year, please click here. The Leap Sandcastle Contest is a fundraiser to support arts education programs in local elementary schools. As part of the A/E/C industry, F/E understands the importance of students building skills to increase creativity and curiosity in the classroom. Leap’s programs serve over 6,000 students in more than 25 elementary schools throughout the Bay Area. Our goal is to raise $10,000 for arts education! If you’re interested and available to donate to our team, please click here.